I'm a cookbook addict. I own over 500 and the collection never seems to stop growing. Cookbooks are my heroin! Still, I really can't recall ever encountering a cookbook as stunning, comprehensive, and fun as the brand new book by Chef John Folse, "The Encyclopedia of Cajun and Creole Cuisine". The book is large format, must weigh almost 20 pounds and has over 700 recipes! Quite a feat. If there is any fairness in the world this book will sweep the cookbook awards for 2004. But perhaps not, since it was self-published. The first 125 pages (840 pages in all) are dedicated to a fascinating in-depth history of the cooking of Louisiana. The history alone would have made a good book. But then the recipes start. The extensive collection of recipes is beautifully illustrated with full color pictures...often double spreads. Bear with me while I share some of the pictures with you. That's the illustration for "Mamere's Old-fashioned Vegetable Soup". "Lafitte's Black, White and Red Bean Salad"
A double spread showing how to prepare crawfish etoufee. This is called "The Bayou Two Step" and it makes me want to two-step to the store to buy the ingredients! Another double spread showing "Creole Panzanella". The pictures go on and on for 800 pages...but this gives the idea. I promise you, you won't be disappointed. The first salad I made was based on a recipe from Epicurious. Wrap whole beets in foil and roast in a 425 oven til tender. (To avoid leaks in the oven I usually place the beets in a foil-lined bread pan and cover with more foil.) Meanwhile, saute sliced almonds in 2 T EVOO til pale gold and allow to cool in oil. Remove almonds and reserve oil. Prepare dressing: combine reserved oil with 1 T lemon juice, 1 T sherry vinegar, 1 minced shallot, S & P to taste. As soon as beets can be handled, slip off peels, slice and combine while still warm with dressing. Allow to cool. Arrange some greens on individual plates. Top with sliced beets, cubed Asian pear, almonds and any dressing remaining in bowl. This makes a fairly substantial salad that could serve as an entree with soup and bread. 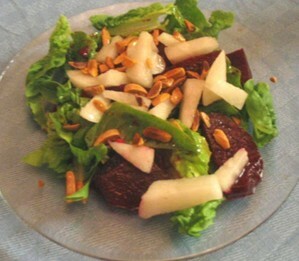 I also made a beet salad from "Simply French: the Cuisine of Joel Rubochon" by Patricia Wells. Wells is the author of one of my favorite cookbooks, "Bistro Cooking", which has a fabulous collection of potato gratin recipes. I wasn't as impressed with this recipe as I expected to be. The seasonings were a bit too subtle for my taste. Roast beets til tender. Prepare dressing: combine 1 t red wine vinegar, 1 t sherry vinegar, 2 T EVOO, 1 T canola oil, 2 T cream, 1 T horseradish, white pepper and salt to taste. Toss dressing and peeled beets while beets are still warm. Let cool. I'd add more horseradish and vinegar next time. One bonus about both these recipes is that the beets can be roasted and tossed with the dressing well in advance. Even a day in advance.